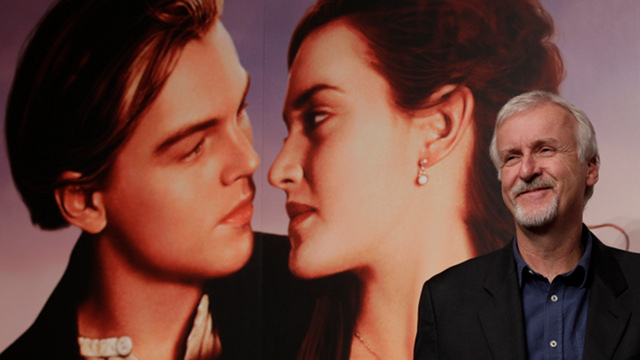 Titanic, one of the the most successful films of all-time, was re-released in 3D earlier this month. The respectable box office receipts thus far are a testament to the enduring appeal of director James Cameron‘s passion project. A technical marvel that pushed the limits of special effects technology of its day, the film also catapulted star Leonardo DiCaprio into super-stardom and established Cameron as a filmmaker who could continue to create big budget blockbusters, while operating with relative autonomy. However, Titanic, like Cameron’s most recent film Avatar, succeeded despite a relatively clunky and cliche-ridden screenplay. Which begs the question, can we really consider a writer/director with a tin ear for dialogue a visionary filmmaker? Cameron himself has admitted that writing is the aspect of the filmmaking process that he enjoys least. However, Cameron is such a control freak that he has been unable to relinquish the screenwriting duties completely. To his credit, Cameron paces his stories very well and this is the reason why a 3+ hour film like Titanic can remain so watchable to the fanatical fans who have re-watched the film repeatedly. He structures his stories very well and consistently demonstrates powerful storytelling abilities. Unfortunately, his screenplays also frequently give off hints that Cameron has no idea how real, breathing human beings actually speak. to Rose in the sitting room. Those mud puddles were certainly a waste of money. truth without logic. What's his name again... ? sketchbook and drawing materials on the marble table. Will this light do? Don't artists need good light? She goes into the adjoining walk-in wardrobe closet. In this scene, Cameron treats us to another scene featuring a discussion about the other artist he has heard of. If Jack (Leonardo DiCaprio) is really an artist, would he praise another artist by stating something as banal as a compliment on the usage of color? Usage of color? Really? The characters speak like this because they are nothing more than cardboard cutouts reciting wooden dialogue from the Cameron universe. They are archetypes that serve their roles so that Cameron can dazzle us with his 3D and CGI. Yes, Jim Cameron writes terrible dialogue, but he still resides several levels above George “I have a bad feeling about this” Lucas as a screenwriter. Furthermore, Cameron, despite his faults as a writer, remains a master storyteller who paces his stories well enough to succeed, despite his substandard dialogue-writing. Hence, he writes just well enough to provide a platform to showcase his visionary skills as a filmmaker who pushes the technical limits of the motion picture medium. David Cronenberg: The Return of the King (of Venereal Horror)? I like how you ding Cameron and bash Lucas at the same time, for the same “crime.” Both directors are far more interested in getting to the good stuff… the action… than plodding around with character-revealing verbiage. And for the most part, their audiences are right with them, tolerating the talk until the bullets/lasers/deckchairs start flying around people’s heads. Still, we are willing to concede these miscues to our visionaries… would we be as charitable with our hacks? No way Cinque.